The Gold Vienna Philharmonic, commonly referred to as the ‘Philharmonic’ or the ‘Gold Phili’ is the Austrian Mint’s (Münze Österreich AG) most successful product. Launched in 1989, the Philharmonic was the best-selling bullion coin in Europe and second in the world by 1990. The coin continues to perform exceptionally well and is the ideal option for both new and established investors. Manufactured in fine .9999 (24 carat) gold, the Phili pays homage to the world-famous Austrian Philharmonic Orchestra. The obverse shows a selection of orchestral instruments and the reverse features an image of the Golden Hall of the Vienna Musikverein. CoinInvest stocks attractively priced gold, silver and platinum Austrian Philharmonics in various denominations and they’re VAT Free within the EU. The Vienna Philharmonic was the first regularly issued investment coin with a face value in euro. Still issued in schillings up until 2002, the Philharmonic (also called the Phili) has become a constant on the investment market since then. The Philharmonic is minted in Vienna, the city in which Mozart, Haydn and many others shaped classical music. Therefore, naming it after the Austrian capital's famous orchestra was the obvious choice. Just one year after its release in 1989, the Philharmonic was the best-selling investment coin in Europe and reached second place worldwide. In the 1990s, the coin was even cited several times by the World Gold Council as the most sold coin worldwide. The success of the Philharmonic has continued since then too. In the 2000s, the coin accounted for 30-40% of investment coin sales in Europe. Initially, the Gold Phili was only issued in denominations of 1 ounce and 1/4 ounce. In 1991 the denomination of 1/10 ounce was introduced, followed by 1/2 ounce in 1994 and 1/25 ounce in 2014. Furthermore, the Silver Philharmonic was issued in 2008 and the Platinum Philharmonic in 2016, each weighting 1 ounce. 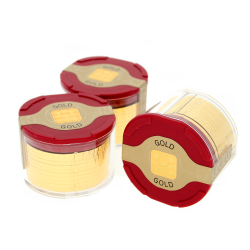 The purity of the gold coins is 999.9/1000 and 999.5/1000 for the platinum coin. The purity of the silver coin is not stamped as a number, but simply referred to as fine silver (which corresponds to a purity of at least 999/1000). As an investment coin, the design of the Vienna Philharmonic has never changed. Since its introduction, the front (also called the obverse or picture side) shows instruments of the Vienna Philharmonic: a horn, a bassoon, a harp, four violins and a cello. The back (also called the reverse or value side) is decorated with a detailed image of the famous organ in the great hall of the Wiener Musikverein (Viennese Music Association). In addition to Europe, Japan, North America and in the last few years China have become increasingly popular markets for the Vienna Philharmonic. Because of its high level of popularity, the Philharmonic offers good resale potential and is particularly suitable as an investment coin. Take the opportunity to add this renowned coin to your portfolio today. We offer gold, silver and platinum Philharmonics at fair prices and the opportunity to sell your existing stock. If you have any questions, please do not hesitate to write to us or contact us at +44 20 36950335 .